During HIV infection alterations occur in iron distribution that are mediated through changes in the primary iron and haem transporters and storage molecules (transferrina, ferritina, lactoferrina, Hp, haemopexin and caeruloplasmine) and recuction of intestinal iron absorption regulated by hepcidina: this is a defensive strategy of the APR (acute-phase-response) used by our organism to reduce the disponibility of iron for patogens. On the other side this lands to an unintended consequence wich is anemia of chronic disease (ACD) in which citokine blockade of iron distribution can yeld the co-existance of peripheral anemia and iron overload in the liver and/or bone marrow. Therefore, HIV-1 infection can cause paradoxical alterations in iron metabolism with the co-existence of anaemia alongside high circulating ferritin and iron deposits suggestive of iron overload. Clinical studies have frequently observed macrophage iron loading in patients who are HIV-1 positive, and one such investigation demonstrated a positive correlation between the degree of iron loading in bone-marrow macrophage and mortality.There are several reasons why the accomulation of iron in macrophages might be an indicator of poor outcome in Hiv infection. 1- Macrophages harbour an important reservoir of HIV-1 that is comparatively drug resistant. 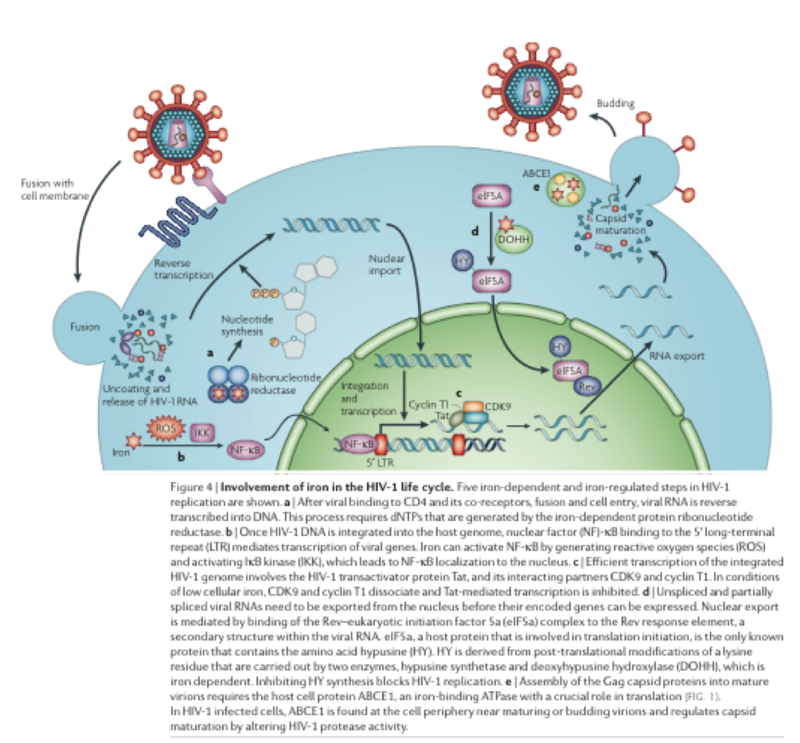 - After viral binding to CD4 and its co-receptor, fusion and cell entry, viral is reverse transcribed into DNA through a proces that requires the iron-dependent protein Ribonucleotide Reductase. - Nuclear factor (NF)-kB initiates transcription of the integrated viral genome from the 5'LTR (long terminal repeat) and it is the iron to activate NF-kB though generating Reactive Oxygen Speaces and activate a Kinase that leads to the NF-kB localization into the nucleus. - The transcription of the HIV genome needs the HIV protein Tat that it is inhibited in condition of low cellular iron. - Unspliced and partially spliced viral RNAs need to be exported from the nucleus before theyr encoded genes can be expressed. This export needs a host protein complex in which takes part the aminoacid HYPUSINE (HY), derived by a post translation modification of Lysine carried out by iron depending enzymes. Inhibiting HY sintesis block HIV-1 replication. - Even assembly of the GAG capside proteins into mature virions requires an iron-binding ATPases: ABCE1, a protein essential for translation initiation and ribosome biogenesis in our cells, but recruited by HIV-1 Gag and co-opted in virion construction.Seems obvious that iron could promote HIV-1 replication. 3- In vivo macrophage iron loading in the contest of HIV-1 infection could have further consequences that would be detrimental to the host: infections by secondary pathogens (charateristic of AIDS) becouse these organism requires iron to grow and some as M.Tuberculosis target macrophaces. Therefore iron accomulations in macrophages might favour not only HIV-1 replication but also colonization with other patogenic microorganisms. 4- Cells that produce most HIV-1 virions can be co-infected by secondary pathogens. For example also EBV can enhance Linfo B capacity of incorporate iron: cells coinvected by HIV and EBV can easier lead to Linfoma. 5- Of course, another detrimental side effect of chronic iron deposition in macrophages is anemia, affecting erytropoiesis. Such anemia of chronic diseas is observed in various viral infections and unsurprisingly is associated with a poor prognosis. How can macrophages fill-up with iron? Macrophages take up iron from the haemoglobine of red blood cells as itself or complexed with Haptoglobin. This uptake is mediated by the macrophage scavenger receptor CD163, wich has ten fold higher affinity for the Haptoglobine phenotipic variant Hp2.2. The Haptoglob2.2 variant has been linked with significantly higher mortality in HIV infection. The final stage of iron recycling is its export from the macrophage by Ferroportin, a process that is inhibited by Hepcidin. In some cases of anemia of chronic disease, an enhancement of hepcidin levels that in brought about by inflammation is thought to be responsible for the accumilation of iron in macrophages and the suppression of eritropoiesis. Although the association between anaemia and decreased survival has not been proven to be causal, the consistent findings of numerous studies of large observational cohort design suggest anaemia is an important factor in understanding the clinical course of subjects with HIV. Investigating the putuative links between iron status, disease progression and mortality in patients infected with HIV-1 is complicated by some confounding conditions: most measures of iron status are strongly influenced by the APR, which is frequently active in individuals infected with HIV-1; APR related redistribution of iron can result in paradoxical iron depletion in some body compartments and iron overload in others. Noumerous studyes confirm that anemia leads to a poor prognosis. Increasing concentrations of ferritin were accompanied, or closely preceded, by rapid disease progression in HIV-seropositive children. Other studies have shown that serum ferritin concentrations in HIV- seropositive subjects were associated with the severity of infection when evaluated clinically as disease stage, immunologically as CD4 + cell count or virologically as serum p24 antigen title and plasma viral burden.Given these early indications of a role for elevated iron in vivo, mechanisms that might explain the possible detrimental effect of iron have been subsequently investigated in HIV infection. These include: direct cytotoxicity and immune dysfunction; enhancement of viral replication; predisposition to certain opportunistic infections and neoplasia; and alterations in the immune response that may affect HIV virulence. Iron loading is associated with the active production of hydroxyl radicals through the Haber–Weiss or Fenton reaction. The resulting ROS (reactive oxygen species) are associated with the oxidation of nucleic acids, chromosome breaks and peroxidation of unsaturated fatty acids. It was also observed that the expression of TfRs (Tf receptors) is down-modulated by acute HIV-1 infection in T-lymphoid cells and thus cell phenotypic modulation is associated with the cytopathic effects of the virus and, importantly, this effect can be modulated by iron chelation (with sodium citrate or DFX).